TAM, debating, McConnell, fish, TAM and more! 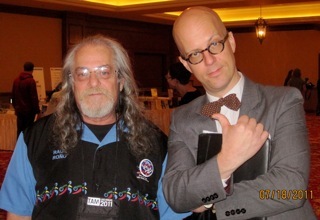 TAM9 from outer space - Kil was reporting on-site. Some. A lot more is below. Brand New Creation/Evolution Debate Forum - A new blog is presented and critiqued. McConnell said - …things expected from a Republican. Editor’s Choice: What about garra ruffa fish therapy - It’s for the birds fishes. 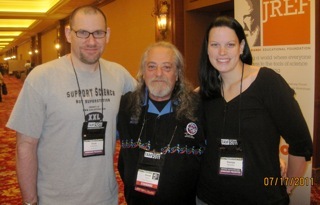 TAM9 — The pick that you can’t go to now that it’s already happened. Hopefully, you were there. Yeah. Kinda silly for me to pick a page and an event that’s history, but what the heck? I didn’t want to write a full-blown article about the affair, so I thought I would blog a little about it here in our Skeptic Summary. The only method to my madness is that I’m lazy. I can’t face writing another TAM Kil Report. There is just so much that goes on at those events, that to do it justice requires a whole lot of writing. And, of course, remembering, which is not one of my strong suits. Anyhow, yes. This TAM was the best ever. Well, at least the best one that I have been to. Having said that, it’s tied with TAM4 as my favorite TAM. 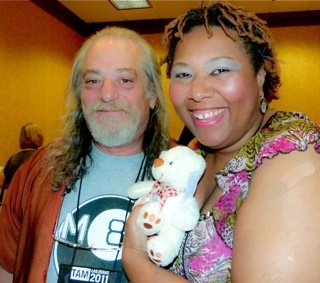 I can’t go back further in drawing any comparisons, because TAM4 was the first TAM I attended. I missed the fraction-numbered TAMs, held in Florida, and the cruises and TAMs in other countries, so my experience is limited to TAMs with whole numbers that happened in Las Vegas. If you clicked on the link, or attended TAM9, you are well aware of the astonishingly great lineup for the event. Other good news for those of us who care is that fully half of the speakers were women. Also, with 1600 attendees, 40% of them were women. In our community, that’s progress. The speakers were all very good. Honest! And some were simply outstanding. Among my favorites were Neil deGrasse Tyson, who would probably still be my favorite even if he were reading a phone book. He’s that good. He talked about how science is being misused and misconstrued by politicians and how religion in America may be having a detrimental effect on our quest for knowledge. He reminded us of the importance of a good science education and America’s decline in that department. Richard Wiseman brought out his bag of tricks, as examples of how we fool ourselves. He is always a favorite of mine. Bill Nye was engaging, talking about being an actual student of Carl Sagan and his concerns about global warming. Eugenie Scott made it clear that the NCSE is going to be taking on climate change denial. That’s a good thing. I agreed with most of what Elizabeth Loftus had to say. Laurence Krauss reminded us that human space travel is more about adventure than it is about science. Pamela Gay told us how science inspired her and why she became an astronomer. She worries about the future of astronomy because of a continuing reduction in funding along with our government’s loss of interest in space science including the possible cancellation of the The James Webb Space Telescope, She worries that kids may not be so inspired to pursue a carrier in science as she was. PZ Myers sees no reason why intelligent aliens would look anything like us. Niel deGrasse Tyson delivering the keynote address. I could go on about individual speakers, but it would get boring if it hasn’t already. They were all good. You will just have to take my word for it. Panel discussions are usually my least favorite part of TAM events. This year was different. The panel discussions were strong. And the one on future space exploration with Bill Nye, Neil deGrasse Tyson, Pamala Gay and Laurence Krauss (with Phil Plait moderating) actually received a standing ovation! In five previous TAMs, I have never seen that before. A highlight from that one was Pamela Gay shushing Neil deGrasse Tyson and getting away with it, three times! Neither Tyson nor Gay are lacking in enthusiasm. And then there was Tyson’s observation that governments historically fund exploration, and business moves in after that. The concern is that it’s business that’s being handed the baton, and business is never in it for pursuit of knowledge. High risk is not their game. They are good at coming in later and finding ways to make it efficient for making a profit. There was a free vaccination clinic called Hug Me! I’m vaccinated!, sponsored by the JREF, Skepchick and the Women Thinking Free Foundation. I received a TDaP (tetanus, diptheria and pertussis) vaccination booster. And I was hugged. I also met Jamila Bey there while waiting to be vaccinated. We music-challenged each other. She was on the great Diversity in Skepticism panel along with D. J. Grothe, Debbie Goddard, Greta Christina and Hemant Mehta (moderated by Desiree Schell). 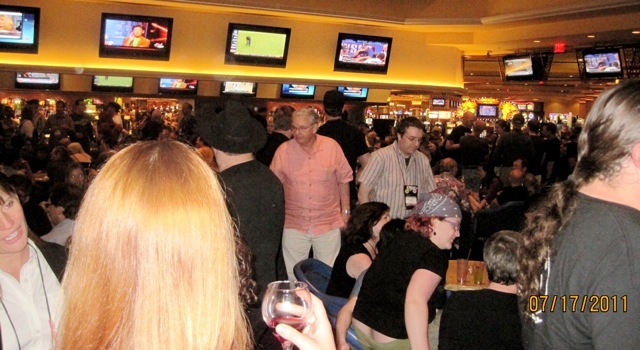 There was lots of hanging out at the Del Mar lounge and bar in the The South Point Hotel, Casino & Spa, where TAM9 took place. Perhaps too much hanging out for me. I’m not used to drinking that much beer. 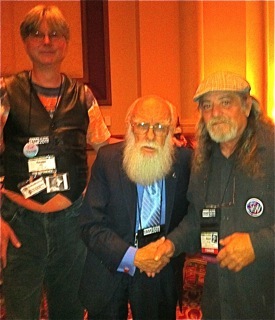 But it was fun chatting with fellow TAM travelers and JREF forum members. This was a typical evening at the Del Mar during TAM. just below, for those who opted to have some food with their drink. That’s where I bought most of my dinners. 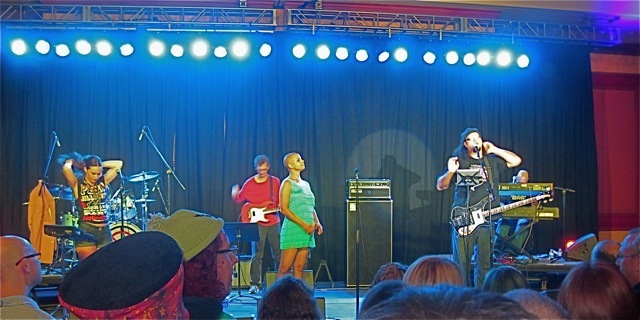 I should mention Penn Jillette’s Private Rock & Roll, Doughnut and Bacon Party. The music was good, the people were fun, and as advertised, nothing was learned. It was a party! I should also mention that ThorGoLucky, a fellow SFN member was there. Torsten Pihl runs the wonderful Debunkatron site. 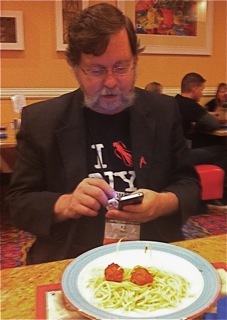 We made the most of the reception and also had dinner with PZ Myers while at TAM. We had fun. Several of the photos came from ThorGoLucky’s phone. I took them. It seems I might have ruined some of them. He told me later that my thumb was heavily featured. What am I missing here? Well… A lot! 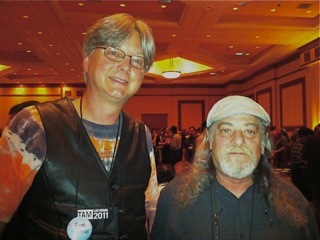 I strongly recommend that you buy the DVD of TAM9 when it goes on sale at randi.org. It’ll be well worth owning. 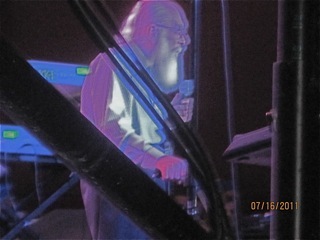 Randi’s aura captured at Penn’s party! For several more photos, see my TAM9 photo album on FaceBook. Wednesday the 13th: While Kil is out of town, visiting TAM-9, one would have thought that chat wouldn’t be as lively as usual, but it was. Initially, we talked about the American economy and the risk of the government defaulting. In the worst case, the rural community can live off the land. Elevetorgate was also discussed but not debated, mostly on meta-level since all involved realised the potential for hurt feelings. The debunkingatheist blog was mentioned in not-too-favourable vocabulary, due to the writer’s dishonest debating tactics. But there are more than one of those blogs… The chat ended with some work-talk. 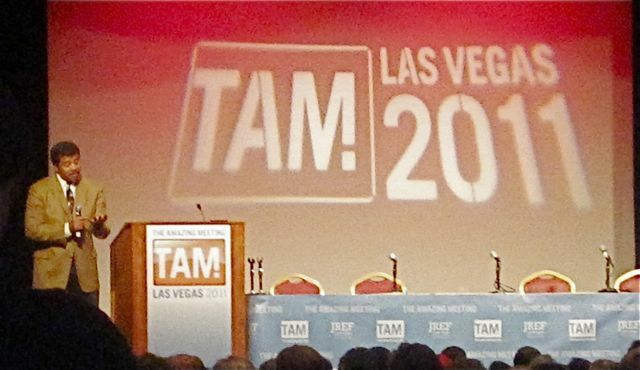 Wednesday the 20th: We talked about TAM9 because I was just there. The subject turned to finances and money and saving money and I glazed over. Not that I don’t care about money, but the subject makes me depressed. But everyone else seemed to enjoy the conversation. Elevatorgate came up. I suppose there’s just no escaping it. It’s not that it shouldn’t be talked about. Always willing to oblige. Anyhow, I kept getting called away for one reason or another. And there is no chat log, so this is it. I’m sure, once again, a good time was had by all. Why is religion stronger in economically unequal societies? Caveman Logic: The Persistence of Primitive Thinking in a Modern World, by Hank Davis. There were 5,864 daily visitors this week.